Looking for some original machine embroidery design to decorate your baby stuff with? Take a look at this funny and creative needlework which features a baby elephant. She’s already a little star as she’s training to be a ballet dancer. The baby elephant is wearing a ballet tutu and a hair decoration with a rose flower. The color palette is a mix of floral pink, carnation, saffron, aspen white and black. Stitch out this dreamy animal to any of your kids’ favorite stuff, for example rompers, onesies, hoodies, T-shirts, sweaters, pajamas, towels, blankets, toys, cushions and much more. I love the embroidery elephant series, very cute hippo, great company)) Turned out very nice and simple. Fast download and great quality of patterns. LOVE it!! 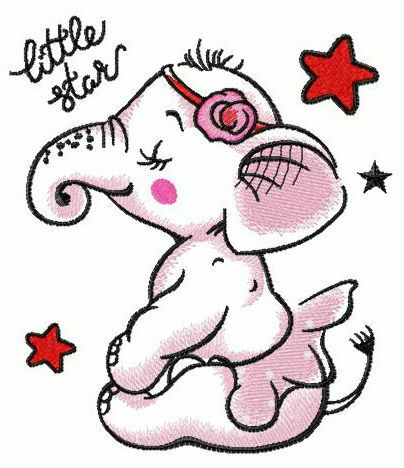 The little elephant looks great on a baby t-shirt. Darling embroidery. exactly what I was looking for! Thank you! !